In a previous post, I discussed 3 reasons that I loved using the Jesus Storybook Bible (JSB) in my Capernaum club talks at Lost Canyon. I went even further and said that I would be working in some of the phraseology of the JSB in my club talks for all kids. In this post, I want to take a more technical look at the Bible, translations, and the JSB. I am a Young Life leader, but I am also a college professor who has taught Bible translation theory and hermeneutics for the better part of a decade. I don’t claim to be a world-expert, but I would say that I am fairly informed on this topic. 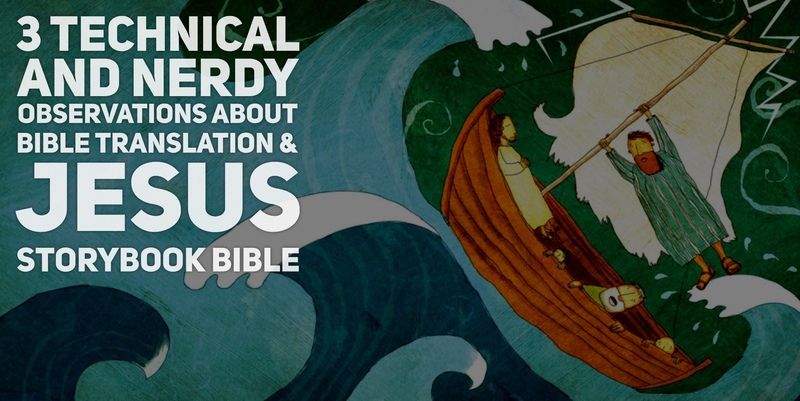 Below are 3 critical observations regarding Bible translation and the Jesus Storybook Bible. Is the JSB like the Message? The first thing people might say about the JSB is that it is like the Message translation of the Bible. My answer: Yes and No. Yes, the JSB is similar to the Message in that both are considered a paraphrase and/or idea-for-idea wording of the biblical stories. The JSB and Message are not word-for-word translations. The authors of the JSB and the Message expand as far as they deem necessary to insert words and editorial comments in order to communicate what they believe is the general thought regarding the biblical story/passage. But, No, the JSB and the Message are different in at least two ways. First, the author of the Message has a PhD in biblical languages and is as much of a biblical scholar as he is a pastor. The Message is a paraphrase of the Bible built upon the original languages of the Bible. To my knowledge, the JSB is not built upon the original languages and is not the work of a biblical scholar. Second, the author of the Message presents the entire Bible in its canonical order (i.e. verse-after-verse, book-after-book for the entire Bible). The JSB presents only 44 “stories” and some of the stories are combinations of different biblical passages. In summary, the JSB is not a “translation” of the Bible—the JSB could be considered a “loose paraphrase of stories found in the Bible”. When Jewish people were exiled to Babylon for the better part of a century, they began to speak the language of the region: Aramaic. As people aged and children were born in Babylon, their Hebrew faded and Aramaic became the norm (this trend happens in many second-generation migration situations). So, when Jewish people came back to Jerusalem their Hebrew language skills were either rusty or completely gone. This brings us to Nehemiah 8. In Nehemiah 8, now that the Temple was rebuilt and the walls were restored, the people wanted to be taught the Scriptures, which they hadn’t heard in ages. Ezra the priest opened the books of Moses and read them in the public square (brief note: not in the Temple, but in a public place that gave access to all people). In the crowd were Levites who functioned as priests and other roles. In Nehemiah 8 the Levites stood among the Aramaic speaking Jews and “gave the sense [of the Hebrew Law/Torah], so that the people understood the reading.” (Neh. 8:8 ESV) Essentially, the role of the priestly Levites was to “give the sense” of the Scriptures in a language and wording which people could understand. Therefore, whenever anyone “gives the sense” of the Scriptures so that people can better understand God’s word in a true and authentic way, they are serving a priestly function. The dual-language capacity of the priest is essential. One must understand the original language (as best they can) as well as the reception (hear-er) language/vernacular (as best they can). I will describe the “original language” side of things below, but for now I want to make a comment about the reception language: Unless a message is understood, it is not helpful (and the message is not conveyed). Thus, the responsibility is on the messenger/priest to understand the language of their audience, whether it is English, Spanish, French, “teenager”, college student, local slang, etc. Long story short, to be a faithful biblical communicator, you need to know the language/vernacular of your audience; in the case of Capernaum Young Life, I think the JSB is generally a great fit to accomplish the task. For other audiences, those who “speak the language” of their audience hold half of the essential information to effectively communicate God’s message. However, please don’t use the JSB as a stand-alone for your preparation – which brings me to my next point. The other half of the equation is to understand the original message before you can translate the message into the language of your audience. In order to understand the original message, I believe each of us should make the most of the resources God has provided us in order to honor the message of the Bible. Our resources are different (and God knows that). Some have time, others don’t. Some have a high capacity for intellectual study (others don’t). Some have finances to pay for further education (others don’t). Some have an amazing intuition to understand the heart behind a message (others don’t or have to work hard at it…like me). No one is “better”, the issue is faithfulness. Be faithful to utilize the resources that God has provided you for the task you are given. Most people reading this (long and nerdy) post can read English at a decent level. Thus, I think a wise step for you would be to consult a modern word-for-word translation before attempting to utilize a paraphrase (such as the Message or the JSB). If you are interested in learning more about the original languages, I put together a series of posts and videos for YL leaders HERE (look specifically at video 1 beginning at 5 minutes into it). I suggest getting out an ESV or NASB translation of the Bible and reading it slowly and carefully (this is also a priestly duty and activity for those who want to communicate the Bible). These translations are considered word-for-word English translations and will help you stay as close to the text (in English) as possible. After you have carefully read and studied the ESV or NASB, then you are in good place to go to step two, which I mentioned above, where we think through the language of our audience. Summary: Step 1 = ESV/NASB; Step 2 = Find the language of your audience (for Capernaum JSB is a great fit). I want to make one final point about Bible translations. This point is not very technical or nerdy, but it is important. Many people, including myself, love to revel in our own critical analysis of the Bible, when what we need is a carefully placed syringe of God’s word directly into our hearts. I have found that some people are very rigid and, dare I say, prideful when it comes to Bible translations (especially those that insist upon word-for-word translations only, this is particularly acute among ESV enthusiasts…btw I think the ESV is great). When I run into these people I am tempted to show-off my knowledge of Greek or Hebrew to try to one-up them, but then I fall into the same trap: Pride. Pride is poison when we communicate God’s message. Whether we are using the Message, the ESV, or the JSB, we must check our hearts about why we are doing what we are doing. Are we trying to impress or sound authoritative? Or, are we attempting to simply communicate God’s message in a way that people will understand? Probably both. But, we need to be aware of our motives, and our Bible translation choice can be part of it. Here is my suggestion: Hang out with the people you want to reach for Jesus. Learn their language. Then, go back and make the most of the resources God has given you in order to learn God’s message. Then, bridge that gap the best you can. Repeat.